Lorna recently played the role of ‘RTÉ Reporter’ in a new Irish feature film called ‘The Journey’. It is currently filming in Northern Ireland. 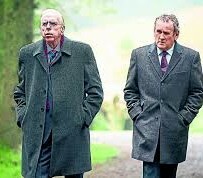 The film features Timothy Spall and Colm Meaney playing the roles of ‘Ian Paisley’ and ‘Martin McGuinness’ respectively. Nick Hamm is directing.